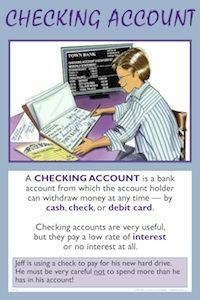 A CHECKING ACCOUNT is a bank account from which the account holder can take money at any time - by withdrawal, check, or debit card. Checking accounts are very useful, but they pay a low rate of interest or no interest at all. Jeff is using a check to pay for his new hard drive. He must be very careful not spend more than he has in his account! The key idea to remember about checking accounts is that the holder of a checking account can withdraw - or demand - his or her assets at any time. This is why checking accounts are referred to as "demand deposits." Funds can be withdrawn in a variety of ways - such as by check, ATM machine, debit card, or wire transfers. Banks often charge a fee each month for a checking account, although "free checking" is often available if you keep a certain minimum balance in the account, fit an age category (such as senior citizen or youth), use a debit card, have direct deposits coming into the account, etc. Typically, checking accounts pay a low rate of interest, or maybe no interest at all, so don’t use a checking account as a savings account! Be careful not to withdraw more than you have in your checking account. This can result in fees and will hurt your credit rating. Banks and credit unions often offer “overdraft protection” to cover an overdrawn account, however, there is typically a fee for this service. Discuss what it means to “overdraft” an account. Discuss why checking accounts are considered “money” in the M1 definition. Discuss how a debit card works to withdraw money from a checking account. Create or copy some checks, and have students practice writing checks. Have them write several checks and keep a record in a check register. Have students investigate different types of checking accounts at local banks or credit unions. They should look for different features such as fees, overdraft protection, minimum balances to receive free checking, interest rates, etc.